And it comes to an end. A magical season, by the Lady Cards, much, much more than anyone expected, and the best in Louisville women’s basketball history. A brave final try against a superior opponent.Â It was an all-out effort for Jeff Walz and crew. No answer inside for the beastly Tina Charles, the precise passing, the skills of a better opponent.Â Angel McCoughtry on her game early, until the defensive pressure and the solid fundamentals of the Huskies shut her down. An effort better than the previous two against the juggernaut but not enough. Hopes were high, ambitions great, the path unexpected and unheralded. No shame in this, no regret, no griping about missed opportunities. Giving their best shot, and falling short.Â The best team won, just what the ESPN crews expected and obviously wanted. Hoping here against hope for an upset. Not getting it but not quitting or giving up. I love this team. I turned the sound off at the start of the game, preferring to watch the game as it unfolded not influenced by commentator dialogue. Sorry Jim Kelch and Adrienne Johnson, didn’t even tune you in. What I saw and observed is a better team overcoming early difficulties and establishing their abilities to beat the team I love, wanted to win. It saddens me, but I am still very proud of these girls. Make no apologies for this game. Praise and hold this Lady Cards dear to our hearts. They were the kids no one expected to be there, and got to this final venue with grit, determination and heart. Time to confess. This observer wrote this University of Louisville women’s basketball team off before the season started. The moment Chauntise Wright went down with a busted knee, a defining moment, signaling that a national championship was out of reach. No doubt, especially for a program that had never been in sniffing distance of the Final Four. But a growing fan base became enraptured with this team, embracing the bandwagon jumpers, the fans, young and old, nearly filling Freedom Hall on two separate occasions, more than 5,000 of them making the journey to St. Louis. Even the knuckleheads who thumb their noses at women’s basketball were unable to avert their eyes. Somehow, some inexplicable way, Jeff Walz guided this team to a 34-5 won-lost record and into the national championship game. Angel McCoughtry. Candyce Bingham. Huge contributors. Deseree Byrd. Still doesn’t remotely resemble a point guard but she knows how to manage the game when Louisville isn’t playing one of the greatest women’s teams to ever take the court. Six freshman learning the ropes, absorbing what it takes to get all the way to the final game. Quite a coaching job by Jeff Walz. And he’s only just begun. Not long into the NCAA Women’s Selection show, the capacity crowd in Cardinal Arena knew the destination of the University of Louisville women’s basketball team for the first two rounds of the tournament. The ranking and the location weren’t the most desirable or popular with the attendees or players. Lady Cards may have been blindsided by a selection committee that included reps from Western Kentucky and LSU. Jeff Walz and the Lady Cards were placed in Baton Rouge as the #3 seed in the Raleigh Region and drew #14 Liberty as their first assignment. They’ll play on Sunday and could meet #6 LSU Tuesday in their backyard if both advance to the second round. 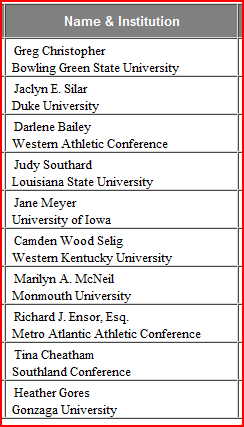 If the Selection Committee is the same as the Women’s Basketball Committee (at right), one would have to question the influence of Western Kentucky’s Wood Selig and LSU’s Judy Southard in squelching the Lady Cards’ ambitions of going to Bowling Green. When the bracket appeared, a lusty roar came from the crowd but quickly subsided when the Cards were steered away from desirable Bowling Green and an expected #2 seed. I had the distinct pleasure of sitting next to Lady Cards color commentator Adrienne Johnson’s mother for the event and she, as well as everyone sitting around me were in shock that Louisville had slipped to a #3 and was going to Baton Rouge. The players showed little emotion as the announcement was made and I heard sophomore center Keisha Hines comment after the show that “It was a bad break for us and the fans…but you have to win them all regardless of where you go…so we’ll just go do what we have to do.” Baylor, who received the #2 seed in the region and won the Big 12 Conference Tournament, wasn’t getting much love from the fans either. “I hope they (Baylor) last long enough for us to meet them..we’ll whip them good!” emphasized Danny Brock, in attendance with his two daughters. Maryland received the #1 seed in the region. Jeff Walz was an assistant at Maryland before joining the Cards two years ago. A tough break for the ladies and their fervent fans with the distance and apparent “home cooking” distributed to LSU, but the Lady Cards have been a good road team this year and should advance to the regional finals in Raleigh to give Walz his chance at the Bears and Maryland…if all goes well. Much at stake Card fans. Saturday will be a long day whether Louisville wins, splits or loses two games against North Carolina. Carolina fans have all but marked both games down in the win columns. Can’t blame them because the University of Louisville has had to make up ground in recent years, getting the men’s and women’s teams competitive. The challenges are immense but Tom Jurich hires people like Rick Pitino and Jeff Walz because they relish such opportunities. Take on the best, means more, even more satisfying, if you beat them in front of their fans. Men must defeat the nation’s No. 1 team, a team with a 32-2 record to make the Final Four. A real shot at a third national championship beckons for the first time in two decades. The surprising trip in 2005 was a major achievement, but nobody gave U of L any chance. However, the Cards are a serious contender this time around; they’re close, they can almost taste it. Got to get past North Carolina first. Women must get past a No. 3-ranked team with a 30-2 record to make the Elite Eight. Would be the first time ever to get that far. This is all new to them. Perennial powers UConn and Rutgers can attest to their toughness, however. It would be too easy to say they’re a year away. That would be a mistake, next year is a mirage, not yet real. The next level is staring the women in the face. Got to get past North Carolina.